Radishes are pretty much the fastest and easiest to grow of all the vegetable crops. They are a cool season vegetable, and can be sown as soon as the ground can be worked in the spring. They can also be sown in late summer for a fall crop. All they require is a loose soil amended with organic matter for optimal root growth. Otherwise, they are practically indestructible plants that mature to harvestable size very quickly. Successive sowings every two weeks or so will supply a continuous harvest. Radish seed can be mixed with seeds from the slower-growing crops, such as carrots, to mark the row. As you harvest the maturing radishes, you will also be thinning the carrot crop automatically. They are also the best vegetable crop to use to introduce children to vegetable gardening, and are a favorite for vegetable gardening in containers. Harvest spring radishes when they are no larger than about the size of a marble or they will become pithy and hot. 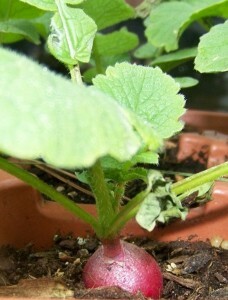 Winter radishes, such as the Daikon types, should be sown in the fall. They take longer to mature (50-75 days) and store longer than the spring varieties. Sow them early enough in the fall so that they can be harvested and stored before the first hard freeze. All radishes appreciate generous watering and a mulch to keep weeds at bay. A fertilizer high in potassium and phosphorus will also benefit these plants. Tip: Soaking washed and trimmed radishes in ice water for a couple of hours before serving increases their crispness and flavor. Health Benefits: Radishes are moderately high in Vitamin C and contain properties that appear to be beneficial for symptoms of colds, flu, fever, cough, respiratory problems, and digestive disorders. For digestive problems, put a handful of radish leaves in boiling water, cover, and let sit for about 20 minutes. Strain, add honey to taste and drink as a tea. For colds, flu, and the associated symptoms, grate one radish and mix with honey to taste. Let this mixture stand for 10 hours in a dark place. Take 2 teaspoons three times a day as a cough syrup. Radish rose garnishes are fun and attractive ways to present many dishes, including salads, meat dishes, or vegetable trays. They are very easy to do and no tools other than a sharp knife are required. 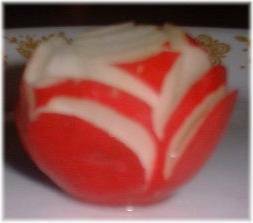 To make a radish rose, wash and cut off a small portion of the top and bottom of the radish. Starting at the taproot end - and starting about halfway down the radish, cut a circular shaped slit, ending near the edge of the radish but not going all the way through. Now do this again on the opposite side, then on the two uncut sides to make four cuts total. Behind these first cuts, just a little higher on the radish, make four more cuts in the same manner. If using a large radish, you can make an extra four cuts between the petals on top, as shown in the picture above. Once you have made all the cuts, gently pull the petals outward, taking care not to break them off entirely, then drop into ice water for about 30 minutes for them to fully open. Presto! You have a beautiful radish rose garnish!